The following article also appears in issue 40.1 of Process Perspectives. From November 30th to December 2nd, 2017, the Whitehead Research Project held its annual conference in Claremont, California. 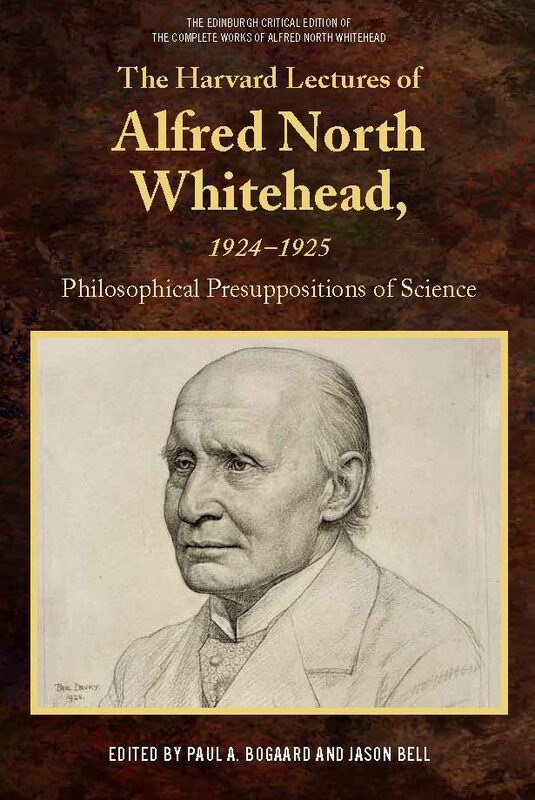 This year, the topic was the recently published The Harvard Lectures of Alfred North Whitehead, 1924-1925: Philosophical Presuppositions of Science, edited by Paul Bogaard and Jason Bell, the first volume in the Edinburgh Critical Edition of the Complete Works of Alfred North Whitehead. The goal of the conference was to explore the significance of this landmark volume for Whitehead scholarship, particularly in regard to our understanding of Whitehead’s philosophical development. This volume of 1924-25 Harvard lectures is the first fruit of the Critical Edition of Whitehead project begun by Brian Henning in 2006, following more than ten years of work tracking down, cataloging, and transcribing hundreds of letters and thousands of pages of student notes taken during Whitehead’s Harvard classes. 1924-25 was Whitehead’s first year in America, and his first time teaching a philosophy class after a long and distinguished career as a mathematician in England. The hope was that the notes taken during this class would throw new light upon the development of Whitehead’s philosophy. The papers delivered at the conference prove that they do just that. Among the many topics discussed at the conference was Lewis Ford’s longstanding compositional thesis, which split Whitehead’s philosophy into distinct “phases,” and claimed that he had discovered temporal atomism in April 1925. But the text of the 1924-25 Harvard lectures simply does not support this theory; key concepts that Ford believed Whitehead had only introduced at the end of the course were actually established at the very beginning. That the volume definitively dispels Ford’s theory is a significant contribution to the field. Another persistent theme through the conference was the influence of fellow Harvard professor Lawrence J. Henderson on Whitehead’s thought, discussed especially by Paul Bogaard in his paper on Whitehead’s philosophy of evolution, but also by Brian Henning and Dennis Sölch. It is not clear whether Whitehead had read any of Henderson’s books prior to being called to Harvard, but read them he eventually did, and the latter’s Fitness of the Environment (1913) seems to have provided him with some key inspiration; Whitehead explicitly credits Henderson’s influence in a mid-December lecture. Bogaard noted in his talk that “in his applying the biological concept of fitness to the physico-chemical environment, Henderson may have been a catalyst in Whitehead’s thinking of how biological concepts can pervade the whole physical universe.” Yet despite Henderson’s clear and acknowledged influence on Whitehead’s thought in the Harvard classroom, he receives only a single footnote in Process and Reality, a pointed illustration of how much might yet be revealed about Whitehead’s influences and philosophical development through continued editing and examination of his lectures. As is now well-established, Whitehead was one of those teachers who simply taught what he was currently thinking about and working on, rather than regurgitate a set course year after year, and so this first year of lectures is only the tip of the iceberg in uncovering formerly unknown insights into Whitehead’s thought. But these were only a few of the themes discussed by some of the leading Whitehead scholars in North America and Europe. Other papers included one on Plato’s influence on Whitehead by Aljoscha Berve, George Allan’s discussion of diagrams and myths, Helmut Maaßen’s exploration of the role of aesthetics in Whitehead’s thought, series general editor George R. Lucas’ talking about what he calls this new picture of an “Alt-Whitehead,” and Jude Jones’ deep dive into some of the new metaphysical implications arising from the lectures, provocatively titled “How ‘Eternity’ Got ‘Thrown Forward’ Into ‘Perishing.’” The Whitehead Research Project hopes to collect these and other essays into an edited volume of conference proceedings. Joseph Petek studied Philosophy of Religion at the University of Chicago, and is currently pursuing a Ph.D. in Process Studies at Claremont School of Theology. He is WRP’s Chief Archivist and Assistant Series Editor for the Critical Edition of Whitehead. Paul Bogaard and Jason Bell (eds. ), The Harvard Lectures of Alfred North Whitehead, 1924–1925: Philosophical Presuppositions of Science (Edinburgh University Press, 2017), xlvi-xlvii. Bogaard and Bell, Harvard Lectures 1924-25, 135. Paul Bogaard, “Whitehead and his Philosophy of Evolution,” (paper presented at Whitehead Revealed: Examining Whitehead’s First Year of Harvard Lectures, Claremont, CA, December 1, 2017), 12-13. GREAT TO SEE THIS WHITEHEAD PROJECT, and this particular summary of it. An important thinker, whose work has not been given its due. Is there anyway to get access to Paul Bogaard’s “Whitehead and his Philosophy of Evolution”? Also is there any material out there on Henderson and/or other Organicists relationship/influence on or compared to Whitehead? We are in the process of editing a volume based on the papers presented at this conference (including Paul Bogaard’s), along with some additional invited papers. We will certainly announce the book on our website when it’s ready. Off the top of my head, I don’t know of any papers prior to this conference that explored the connections between the philosophy of Henderson and Whitehead. To be fair, Henderson’s influence on Whitehead is one of the things that just wasn’t all that apparent until this first volume of Harvard lectures came along. Whitehead references him only once in Process and Reality, for instance (page 89), but it’s pretty clear that Henderson influenced Whitehead a lot more than the paucity of citations in his published works suggests. The Whitehead Research Project is dedicated to research and scholarship on the texts, philosophy, and life of Alfred North Whitehead.